You voters who were around in 1983? 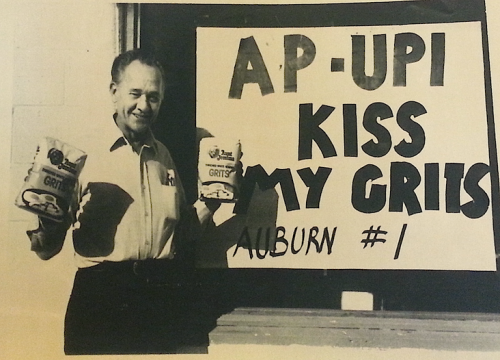 You do not want to kiss Jessie “War Eagle” Fincher’s grits again. In 1983, they should have said more. In 2004 they should have said more. Now they’re saying more. Auburn wants to play for the national championship regardless of whether Ohio State, who is currently one spot ahead of Auburn at No. 2 in the BCS rankings, wins Saturday night or not. And with Missouri’s body’s still warm, Auburn sent media members an “Auburn Football Resume”: Six stats touting the Tigers not as just a Cinderella story written with miracles, but as a pigskin powerhouse that, uh, maybe deserves to go to Pasadena more than any other team in the country. Related: Auburn ties NCAA improvement record from one year to the next. Wow. The shelf-life for this article sure was short. The argument was quickly settled by reality and AU was right all along! The media would have really enjoyed this debate. I can hear Lou Holtz now… Alas the talking heads have to move on to Pasadena! Whether they like it or not.